As you get older it seems like time goes by faster and faster. This summer was no exception; it flew by. Schools are back in session and everyone is buckling down and focusing on work now that summer is officially over. 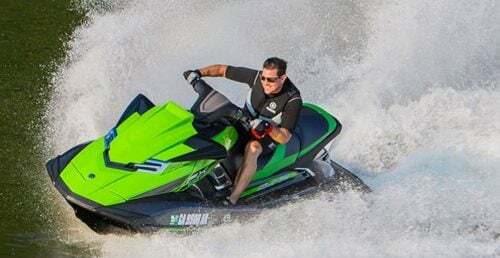 I sat back and thought about what I had done during my favorite season of the year and the one trip that by far stood out was the trip I took with Kawasaki on Lake Mead. I was invited with a few other editors and their kids along with superbike stuntman Jason Britton and his family to camp on Houseboats on Lake Mead. I almost feel guilty for using the term camping and houseboats in the same sentence because it was not really roughing it with modern conveniences like a bathroom and air conditioning. 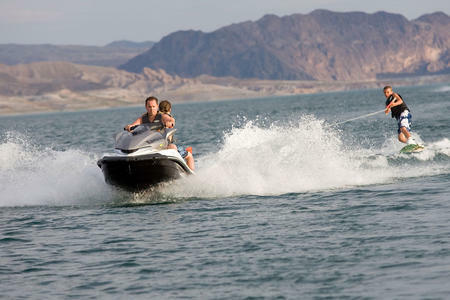 Then again, being the middle of summer on Lake Mead, air conditioning and indoor bathrooms are mandatory. If you factor in a hotel for these basic essentials, the houseboat was a much more economical choice for the size of our group. 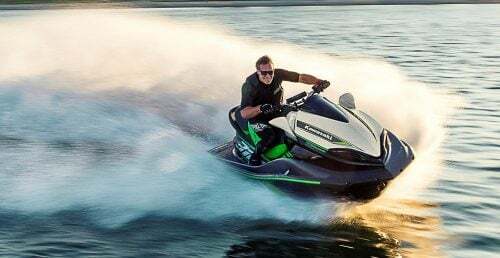 Then factoring the added bonus of having paradise and Kawasaki’s personal watercraft product line at your fingertips it was much more appealing than a Holiday Inn. 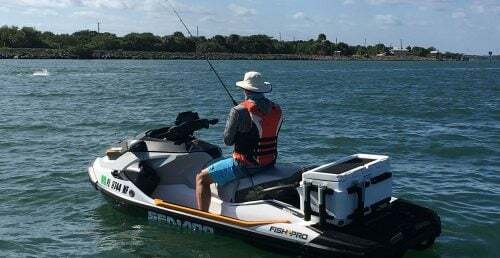 Jason Britton and his family kick up some wake on an Ultra 260LX. With two days planned at the lake, there was a lot of fun to be had with the group’s parents and kids on the PWCs. Our first day started with a morning trip to explore the lake and see Hoover Dam. I was really looking forward too this because I have never seen it before. We stopped off at a few coves along the way to enjoy the natural landscape and see if we could spot any big horned sheep. Unfortunately, there were none to be found here, but we took the opportunity to jump in the water and cool off for a bit before we headed to the next spot called paint pots, which are these beautifully colored mounded hills. It’s a great spot to just sit and enjoy or take photos. 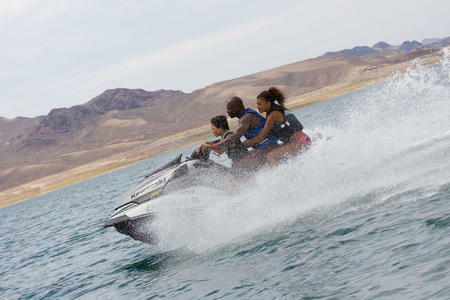 Most of us hit the water again before we headed to our next stop – Hoover Dam. 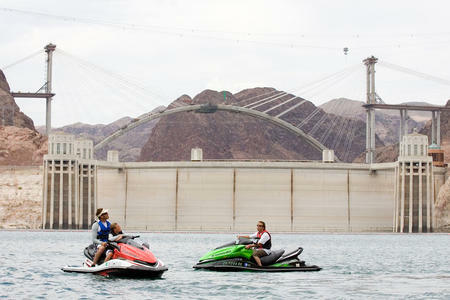 You can’t get too close to the dam for security concerns, but what a site it is to see. To think that it was built in 1936 and was the world’s largest electric power generating station and the largest concrete structure at the time is pretty incredible. We took the usual tourist photos to document the occasion and of course jumped in the water again before we headed to Hemmingway Harbor to fuel up and feed the carp by the docks. 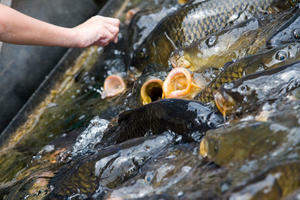 The kids got popcorn to feed the carp. It was really cool and at the same time disgusting, there were so many carp within seconds fighting for the popcorn it looked like you could walk across them. When we ran out of food for the carp and they lost interest in us, we got back on the skis and returned to camp for lunch and to escape the hottest part of the day. 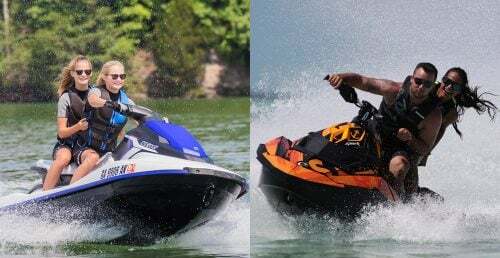 After lunch it was free playtime, you could take the ski of your choice and pick your activity and have some fun on the water. 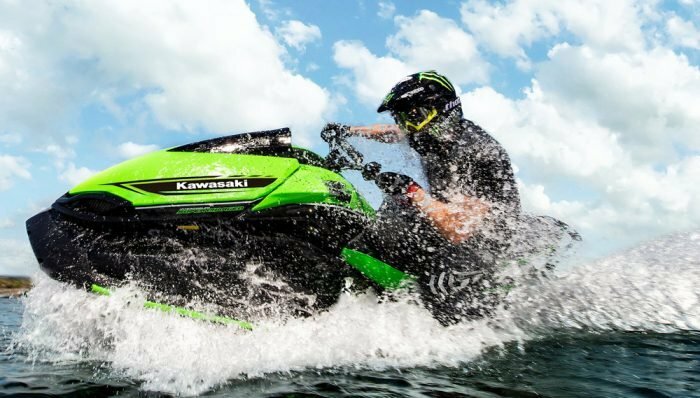 Ranging from towing kids on the tube, wakeboarding, exploring the neighboring coves, or just splashing around, with Kawasaki’s Jet Ski line at our disposal there was something for everyone. 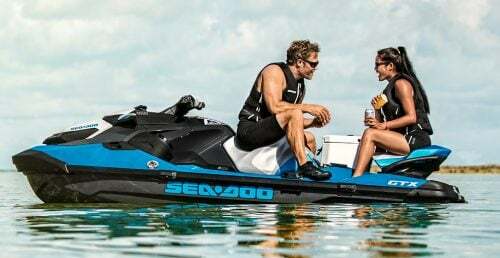 If you wanted a hotrod and the thrill of horsepower and speed, the supercharged Ultra 260X and Ultra 260LX was for you. 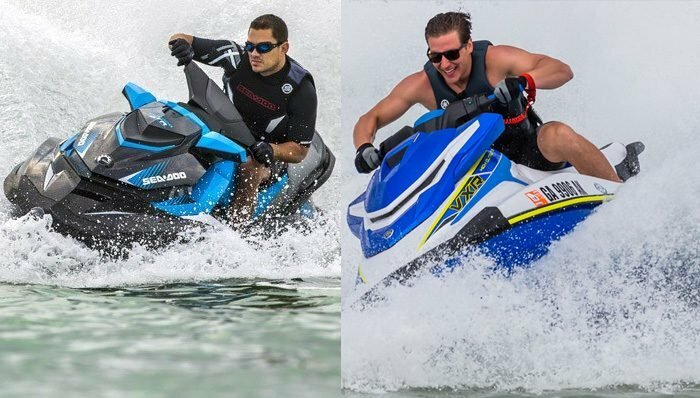 For touring the Ultra 260LX and Ultra LX have the added comfort of a scalloped seat. If all of that wasn’t a big concern and you just wanted something that was a lot of fun to zip around on, the affordable STX-15F was perfect. 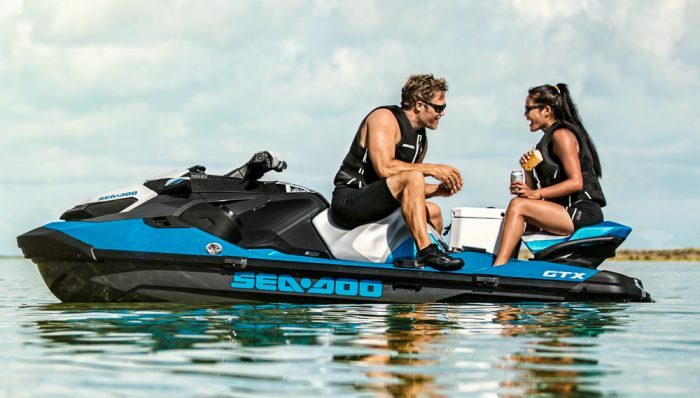 All the vehicles more than fit the bill for pulling kids around on the tube or wakeboard. Speaking of which, wakeboarding was the activity of choice for the kids in our group that first afternoon. In fact, since they were lined up we had two skis with tow duty. Wakeboarding was the activity of choice for the younger folks. For those of us who didn’t have tow duty or chauffer duty, we had two SXR800s to play with. This was my toy of choice – they practically had to pull me off of it. I’m still learning how to ride the stand-up, so I wanted as much time as possible on the flat water. I wasn’t alone in getting my stand-up education; Jason Britton was out there too and naturally putting me to shame. On our second day we had another trip planned for the morning. We all loaded up on the skis and headed to the Narrows, which used to be known as Boulder Canyon. We learned that this was actually the site they originally planned on building the dam. The Narrows connects the Boulder Basin, which is the area where we were camped and where the dam is, to the Virgin Basin. Its name is more than an afterthought, as it is indeed narrow and perhaps it feels more so with its towering cliffs on both sides of the water. It is a very beautiful spot and definitely awe inspiring cruising through on a PWC. After we made it through the Narrows we headed over to a cove that Jan Plessner from Kawasaki had seen big horn sheep in several times before, as we had yet to see some on our trip. We pulled in and jumped in the water to cool off and sure enough up in the rocks above us was a whole family of big horn sheep. 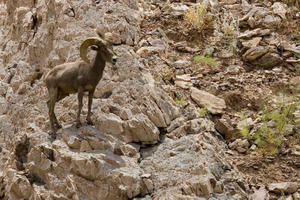 Kids and adults alike were delighted to see these rock scaling mammals up close and personal. We watched them on their family outing for a bit longer, and then headed back to camp for lunch. The afternoon, like the first day, was spent taking the skis out for whatever we wanted to do most. I took the stand-up out again. Most of the others went exploring the coves neighboring ours. There was hardly anyone else out by our cove except for our group and the only thing to be heard was the sound of our skis and laughter. Being single with no kids of my own it was really nice to be on the lake with a group of families. It reminded me of my favorite childhood memories of camping trips with my family. Fast forward fifteen years and another camping trip on the lake and another collection of great memories.